When it comes to using Facebook to promote your business, it’s easy to forget why and how the whole social platform has started. But the initial intent of Facebook was to connect people – to help individuals socialize. This is why it’s essential for you to respond to all comments on your page. The ultimate Facebook success is when you can use it to form relationships. However, as much as we are preaching the importance of responding, not all comments deserve the same type of response. The etiquette of how to respond to Facebook comments isn’t cut and dry, but with a few simple principles you can acknowledge your fans and grow a community. Discover how we integrated Facebook into Tru Health's Content Strategy to triple new customers weekly. You aren’t able to directly mention a fan in your Facebook status. However, if a fan comments on your status, you can (often) mention them in that comment thread. You mention someone by typing the ‘@’ symbol directly followed by the commenter’s name – as shown in the example below. As you begin typing the name, a list of options will drop down. Select the appropriate name. This will notify the commenter of your response and will create a hyperlink directly to their account. It’s also worth noting, you don’t have to use their full name. Just their first name. Once you’ve selected the appropriate profile, you can delete everything but the first name. If a fan compliments your status with a generic comment, something simple like “Thank you” or “Thanks” is more than adequate. However, if your fan’s compliment is more detailed, such as acknowledging something specific about the content or image you’ve shared, it’s best to respond in equal measure. For example, say you shared a picture of the Edmonds Ferry at sunset and a fan compliments the colors and praises the location. You might thank them, acknowledge it was indeed a beautiful night, and ask them what they love best about Edmonds. Learn more about how to say 'thank you' to compliments. Note: Asking a question isn’t necessary, but it does encourage engagement. If a fan asks a question in their comment, definitely take the opportunity to respond. This indicates they actively want to know about you. Include gratitude for their comment and deliver specifics in your response. Learn more about answering questions on Facebook. Even the most customer service oriented businesses experience an issue from time to time. When they happen, great businesses know not to avoid them. If a fan leaves a negative comment, it’s best to respond. Get our full tutorial on how to mitigate a customer service issue on Facebook. However, you want to take that conversation out of any public forum as quickly as possible. Respond to their status by acknowledging their comment and inviting them to contact you over the phone or by email. Include your email and phone number in the response. This shows you respect their privacy. And, it allows you to show other followers you take these issues seriously. Need Help Responding to a Specific Comment? 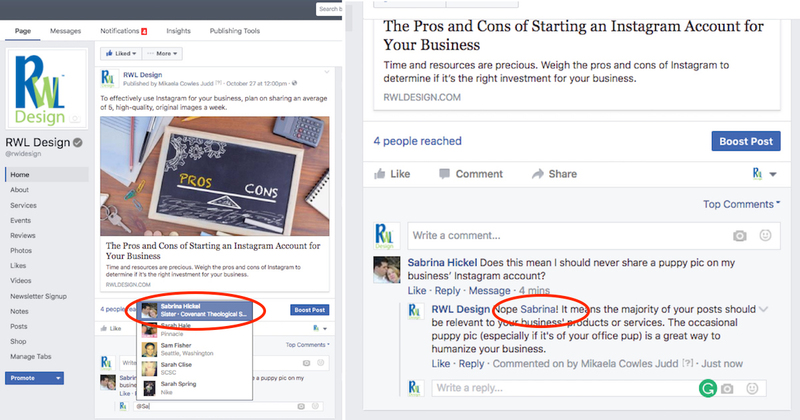 Partner with our team to create highly personalized responses to your Facebook comments.